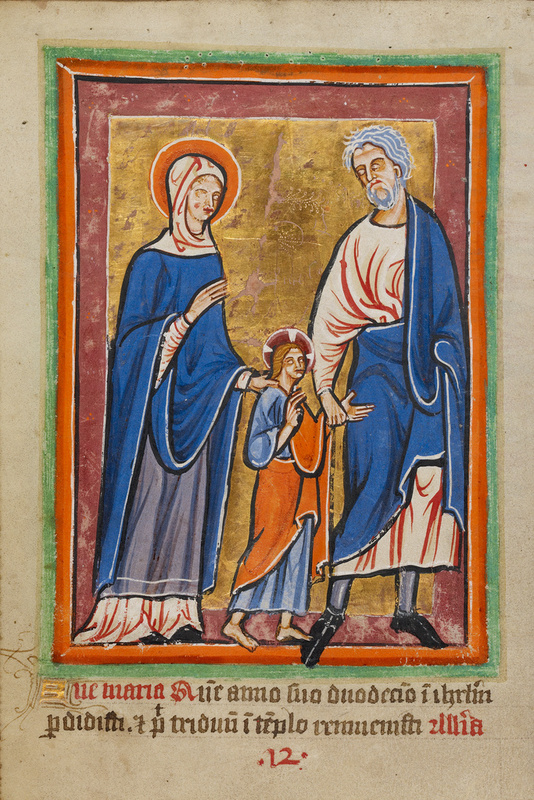 In this touching scene, Joseph leads the diminutive Christ by his wrist while Mary, in a tender display of maternal guidance, places a hand on his shoulder. This illumination depicts a rarely illustrated event in the life of Christ. According to the Gospels, the twelve-year-old Jesus accompanied Mary and Joseph to Jerusalem to celebrate Passover. The Latin text at the bottom of the page beginning with "Ave Maria" ("Hail Mary") serves as a descriptive caption, added in the 1400s to identify the scene.